American consumers borrowed more than analysts expected in May. The Federal Reserve said outstanding consumer credit rose by $24.6 billion, an annual pace of 7.6%. Credit card debt rose by $9.8 billion, an annual pace of 11.4%, the most in six months, suggesting consumers were more confident that their income can support their spending. U.S. employers reported 6.6 million job openings in May, down 3% from April, which was the most in 17 years of data. According to the Bureau of Labor Statistics, the number of openings continued to outpace the number of new hires. 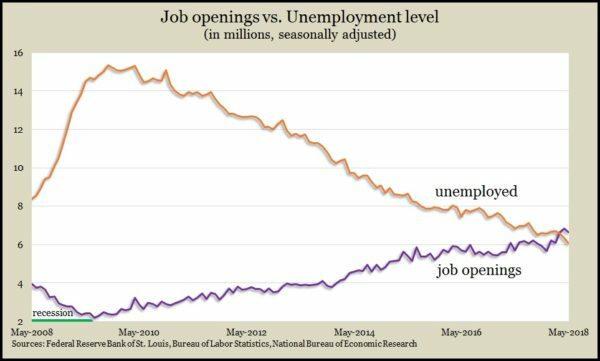 Also, for an unprecedented second month in a row, the number of openings exceeded the number of unemployed workers nationwide. The rate of employed workers quitting their jobs rose to the highest level since 2001, a sign that employees are confident they’ll find new jobs. Mostly because of the increased costs of trade services, wholesale inflation rose in June, although at a slower pace than in May. Including volatile prices for food, energy and trade services, the Producer Price Index rose 3.4% from June 2017, the Bureau of Labor Statistics reported. That was the most since November 2011. Excluding volatile categories, the core rate of wholesale inflation rose 2.7% in the last 12 months. The nation’s wholesalers continued to adjust supplies more closely to demand in May, as inventory levels rose 0.6%, lagging a 2.5% increase in sales, according to the Commerce Department. The inventories-to-sales ratio, a gauge of how lean businesses are operating, dropped to its lowest level since late 2014. Year-to-year, wholesale inventories were up 5.9% while sales had risen 11.8%. The broadest measure of inflation, the Consumer Price Index, inched up by 0.1% in March, held back by a decline in prices for electricity and natural gas. Year-to-year, the CPI rose 2.9%, its biggest jump since February 2012, according to the Bureau of Labor Statistics, led by a 12% increase in energy prices. Excluding energy and food prices, the CPI grew 2.3% from June 2017, the third increase in a row and the fourth in a row above the Fed’s inflation target of 2%. The four-week moving average of initial unemployment claims fell for the third time in five weeks, continuing to reflect a tight hiring market in which employers are reluctant to let go of workers. Data from the Labor Department show new jobless applications are 37% below the 51-year average. Claims have been below average every week since the beginning of 2013. The University of Michigan said its preliminary consumer sentiment reading for July declined, especially in survey respondents’ assessment of current conditions. An economist with the survey noted a rising concern expressed, especially among higher income consumers, about the potential harm from trade disputes. Overall, sentiment continued to run relatively strong, suggesting increased consumer spending.